Stoney Cooper (The Wingman) is an ex-cop who was kicked off the force for his rogue ways. Now living in New York, he is called back to L.A. by his old buddy Sam (Ruscio). It seems a serial killer is on the loose, killing people seemingly at random and leaving an X on their forehead. This “X Killer” claimed Sam’s granddaughter as a victim, and he wants revenge. Meanwhile, Stoney sees this as an opportunity to get back in the good graces of his estranged wife Eddie (Ingalls). The three unlikely partners all team up to put an end to the X Killer’s reign of terror, whilst dodging gangsters, lowlifes and the killer himself. The ever-charismatic Wings Hauser once again shows why we keep coming back to his movies. He doesn’t disappoint - his likable and personable nature are shown off well in this film. 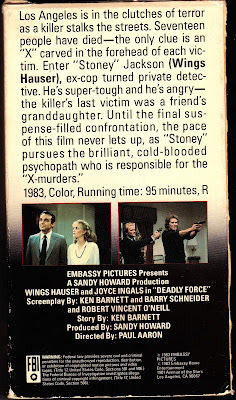 Like other Wings movies such as Reason to Die (1990), the simple plot is basically Wings chasing a serial killer. His personality certainly carries this film. He’s backed up with some solid support, notably Al Ruscio and an amusing cameo from none other than Estelle Getty. We’d be remiss if we left out Lincoln Kilpatrick as Hoxley, the disgruntled, classic stereotype: the Black Yelling Chief. 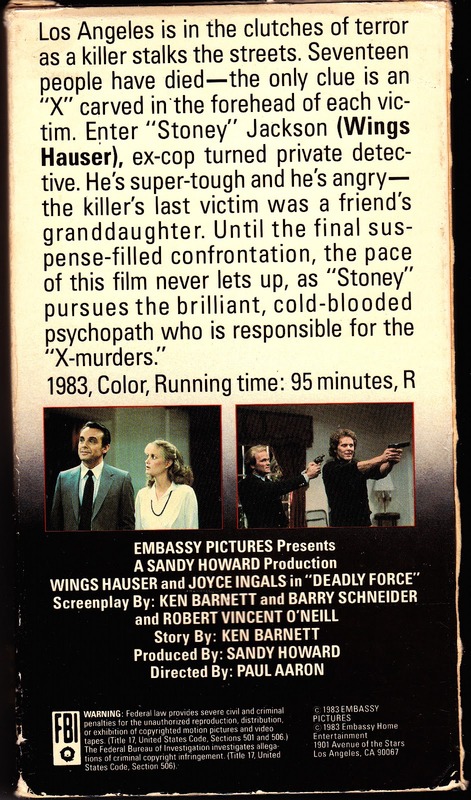 He also played the BYC in the Gary Busey vehicle Bulletproof (1988). He’s had a long career (he’s since passed away), no doubt filling the role he was born to play (the BYC) many times over the years. The soundtrack deserves special mention, especially the driving main theme, and the equally pounding end credits tune, “Keep On Fighting” by Jesse Frederick. Only in the 80’s could you get the car chases, seedy city scenarios, and music such as this, all tied together in a nice bow with Wings at the helm. It truly was a golden age. 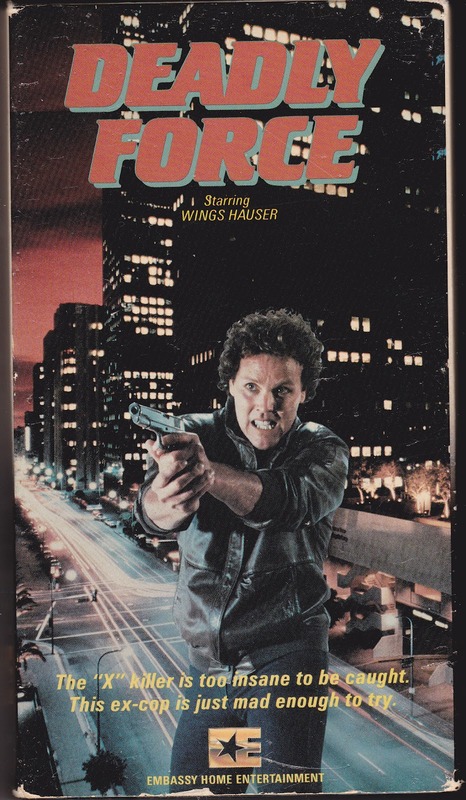 Released on VHS in the U.S. on the Embassy label (later re-released under MGM’s budget-priced “Movie Time” banner), while this movie doesn’t have a ton of originality, it nevertheless should be on the Wings Hauser fan’s short list. Also check out another review by Explosive Action! Cheers for the link Ty! Yup this was a solid one, good Wings here. I laughed at your term BYC - that's gold! No problem, buddy! Also happy you enjoyed BYC. Thanks! This looks awesome. Love me some Wings. A true classic that's hard to find. I'm glad I have a burned out VHS copy. The whole premise of the outlaw ex-cop on the edge is never better than in this classic. I'd also go as far to say that 'Keep On Fighting' is the best piece of unknown AOR to appear in any 80's film. I must have worn my tape out just listening to that. Hauser at his best!! We can't agree more with your comment! Keep On Fighting is a classic tune. That is awesome that you love it too. AOR rules. Yeah i'm a huge AOR fan myself, one of my favorite movie songs is "Streets Of Thunder" in Street Knight. It's always rare to find true AOR fans. I write for the AOR based website http://www.glorydazemusic.com where we eat stuff like this up for lunch. My only wish is 'Keep On Fighting' was ripped somewhere. Us too! It is a solid tune. AOR music lives on in a lot of 80s action movies. It's one of the things that makes the video store era great. If you haven't already, search "Underrated AOR" on Youtube. It is an outstanding series. I'm loving the Hauserathon. Great review Ty. Thanks! We are happy you are enjoying it.